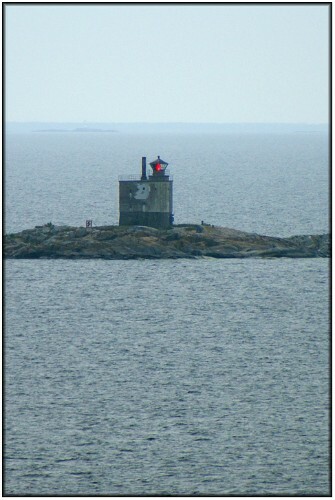 This lighthouse station is located on the tiny, rocky islet of Tjärven in the Sea of Åland just north of the Söderarm Archipelago close to the entrance to the Gulf of Bothnia. These photos were taken very early, on a somewht grey and misty morning as Queen Victoria prepared to enter the seaward end of the highly circuitous shipping channel through the Swedish Archipelago en route for Stockholm. Construction of the station began in 1902, and the light became operation in 1903. The building was originall castellated and contained accommodation for the keepers. The light was initially fuelled by kerosene, but was upgraded to electricical power in 1952 when the building itself also underwent fairly radical reconstruction to a much more modern, and somewhat "bruatlist" appearance, the castellated ramparts being removed and the upper part of the buildng clad in cement bricks. The upper section of the building, from the stone base to the gallery is, in theory, painted white and, although that is not obvious from this picture, I think that one small section of white paint can be seen adhering to the top centre of the building. Internet sources indicate that in 2008, presumably after this photo was taken, the building was renovated and repainted, and the light was converted to solar power, a new lamp being installed in the existing lantern. Rumour has it that many Russian mines dating from World War 1 lie on the seabed to the east of the island, but the water there is very deep and I assume that they pose no danger to shipping. Sources differ as to the characteristics of this light. The Lighthouse Directory mentions only white and green sectors and states that the light flashes four times every twelve seconds. A Wikipedia article mentions white, green and red sectors, the light occluding twice every twenty seconds. In this instance I'm inclined to go with Wikipedia as a red light is clearly visible in all three of these images. The image below shows a more distant view of the light with the Swedish pilot launch in the foreground, departing having dropped off the Queen Victoria's pilot. 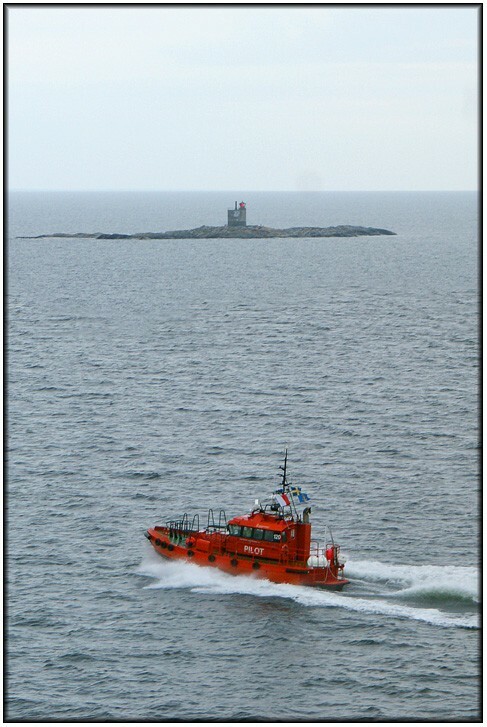 The photo below shows a panoramic view of the light with most of the island in shot.